Is there a better alternative to EZPunch Standard? Is EZPunch Standard really the best app in Applications category? Will EZPunch Standard work good on macOS 10.13.4? 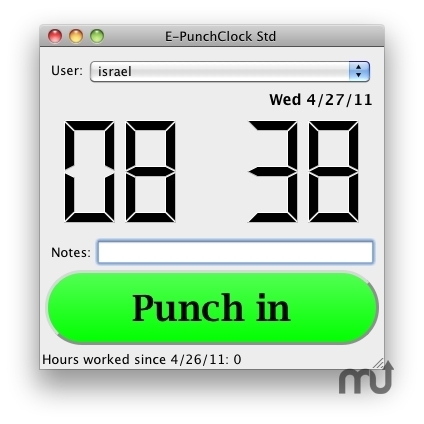 EZPunch Standard is a simple Punch card application modeled after a basic TimeClock. The one-button interface makes it easy to punch in and out, with an optional Dashboard widget for even easier access. PostgreSQL and MySQL support is included for network deployments. Report generator: Generate a basic punch listing report (one line per punch) or in/out report (one line per in/out pair with hours "in" and total hours). EZPunch Standard needs a review. Be the first to review this app and get the discussion started! EZPunch Standard needs a rating. Be the first to rate this app and get the discussion started! Punch export to excel, word, iCal, Outlook etc via tab-delimited, iCalendar CSV, or PDF files. Fixed all hours being shown as overtime in reports under certain situations.